Whether it’s due to a college break, studying abroad, or a job relocation, being in between apartments can be stressful. There are a lot of details to plan for, including travel arrangements, mail delivery, subscriptions, and what to do with your furniture and belongings. EZ Storage is here to help you organize and plan for these transitions. Every successful project starts with a detailed list, and planning for housing changes should be no different. We’ve created an easy to follow, step-by-step moving checklist on our website that not only helps those moving, but is also a great resource for those leaving the country for a few months to travel or study. You have to think about more than just furniture storage when studying abroad. 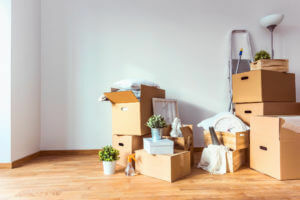 Important details such as forwarding or stopping your mail and magazine services, organizing movers, tips on packing, and making a home inventory are all included in this moving checklist. Moving is a great time to purge. As you assess your furniture and belongings, take the time to decide what should stay and what should go. Keep in mind the size and location of your new home to determine what you should keep. If you are moving to a warm climate from a cold or seasonal climate, you may not need shovels, snow boots and other winter gear. If you are downsizing, consider the room size and configuration. Will your new home accommodate large furniture pieces or have enough storage to accommodate all of your belongings? Selling unneeded items is a great way to make a little extra money, but if you don’t have time, donating is also a great way to make sure that your pieces have a new life. If your belongings have seen better days, consider a junk removal service to help you with the task of discarding furniture and other items that don’t fit or belong in your regular trash receptacles. While you are in between apartments or homes, you’ll likely need to store your furniture and belongings. It isn’t uncommon for college students to rent a storage unit with a few friends to maximize the storage unit capacity and share the expense over summer break or during study abroad semesters. If you’ll be moving back home or staying with a friend, show them courtesy by utilizing college student storage services rather than asking them to store your belongings in their home or garage. Living with friends and family is stressful enough! When looking for a storage facility, focus on a location that is close to your interim housing or destination to make accessing your belongings easier. You’ll also want to find a storage company that offers short-term leasing with flexible contract terms. EZ Storage offers month-to-month storage contracts so you can customize your storage experience to fit your time in between apartments. Need a college student storage unit in the Boston area? Contact one of our managers to learn more about unit sizes and available in our Newton, Framingham or Natick storage locations.